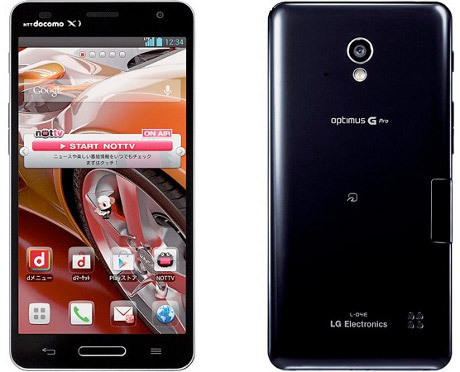 G Optimus Pro, LG Android Phones ~ " World Information "
LG introduces its newest Android smartphone wild. Optimus M Pro, as the name implies, it bears class specification. Like what? This handset is in the category phablet 5 inch landscape display with full high definition 1080p. In addition to the bright screen, the hardware is capable to fight its competitors. performance is certainly speeding with quad core 1.7 GHz Snapdragon S4 Pro. Coupled with 2GB of RAM. Other specifications include a 3000 mAh battery, Android 4.1 Jelly Bean, 13-megapixel camera, 32GB of internal memory, microSD slot and 4G LTE connectivity. G Optimus Pro will first be marketed in Japan with NTT DoCoMo operator in April. Then maybe other countries will be visited.